Federal officials say Texas' testing standards in reading are below the “basic” proficiency standards — and that low bar means those passing the TAKS may not be as proficient as advertised. Parents should view the results of state reading tests with a critical eye: Texas students may be passing their state assessments, but that doesn’t mean they are competitive with their peers nationwide. 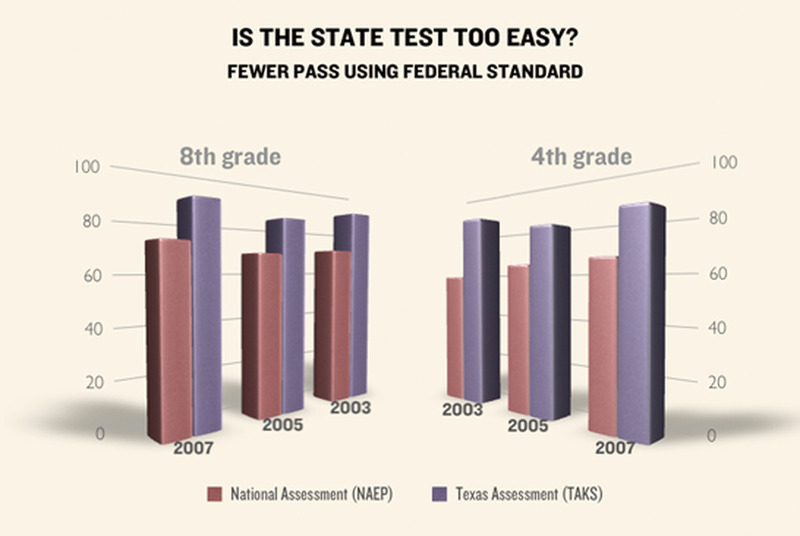 A Texas Tribune analysis of results on the state and national tests since 2003 show wide gaps in results, with the Texas TAKS test showing proficiency rates up to 18 percentage points higher than the National Assessment of Educational Progress, or NAEP. The gaps are apparent in reading at the fourth and eighth grades, the only grades the national test measures. The state's math results tracked pretty closely to national results over time. The U.S. Department of Education released a study two weeks ago impugning too-low standards on state tests throughout the country. It found that Texas had testing standards in reading below the “basic” proficiency standards, as determined by the NAEP board. And that low bar means that those passing the TAKS may not be as proficient as advertised. In 2007, for instance, 84 percent of fourth graders passed the English TAKS in reading, while only 66 percent of those who took the NAEP achieved basic proficiency. The gap extended to eighth grade, where the state test showed 89 percent proficient, compared with just 73 percent on the national test. Arne Duncan, the U.S. Secretary of Education, rebuked states in a news release for setting the bar too low. “We’re lying to our children when we tell them they’re proficient but they’re not achieving at a level that will prepare them for success once they graduate,” he said. Criss Cloudt, who works in Texas Education Agency’s assessments division, countered that the differences don't necessarily prove the state tests inflate student scores. The tests have different purposes, she said. “The NAEP is a test that’s designed to compare states, while the TAKS is a measure of our content standards that have been adopted by the State Board of Education,” she said. Cloudt cites different formats and student motivation factors. She points out that the NAEP test involves writing components that aren’t in the TAKS reading tests. And while the TAKS are end-of-year exams, the NAEP tests come in January, before students have had the benefit of a full year's instruction. Plus, she says, teachers daily emphasize preparation for the state exams. Students don't have the same motivation to do their best work on the federal test. The national test grades a representative sample of Texas students. Its primary goal is to test the rigor of state assessments, but it also allows states to chart improvement over time. The tests allow for cross-state comparisons and an aggregate look at how student learning measures up. “You have to keep in mind that when you’re comparing one test to another, there are likely to be differences,” said Arnold Goldstein, a program director at the National Center for Education Statistics. But nonetheless, no one’s pretending to be happy about the outcome. “I would have liked them to have been closer together,” Cloudt said. So why the difference in reading and not in math? TEA spokeswoman Debbie Ratcliffe chalked it up to greater agreement nationally on math curriculum standards. Despite frustration that reading doesn't match up, TEA isn't ready to change its standards or assessments. Texas is one of only two states that has not signed on to efforts to create a national, standardized testing system with consistent proficiency expectations across states. Robert Scott, the commissioner of education, said TEA was already in the midst of revamping its standards. "They were asking us to sign onto something sight unseen," said Ratcliffe, who quickly assures those concerned that Texas' standards will "meet or exceed" those of the initiative. But TEA also points to other successes in testing. More students than ever before are taking the ACT, a test preparing for college, and while Texas is still behind the national average, the state composite average of 20.8 has inched up steadily since 2005. The national average — 21.1 — has remained pretty flat. Professor Kenneth Meiers, a political scientist at Texas A&M University who specializes in education policy, says the results of post-secondary readiness, like ACT scores, are a better measure. Ultimately, he’d like to see TEA focus on multi-indicator assessments that would measure how schools dealt with students at the top and the bottom of the spectrum — not just the middle ground of "proficiency" — as well as how they deal with issues like truancy. TAKS, he says, only shows one part of the equation. “The problem being, if you focus on maximizing scores on TAKS, you’re probably giving up something else that you were thinking about teaching,” Meiers said. But that doesn’t mean TEA should disregard the recent disappointments in reading proficiency. “NAEP is a nice correction if you’re getting wildly optimistic on what you’re doing with TAKS,” Meiers said.